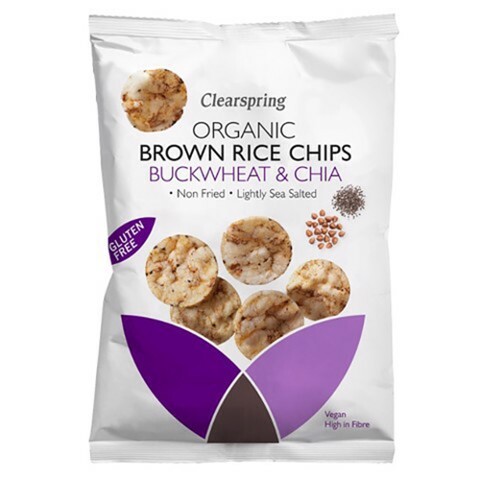 Clearspring's organic brown rice chips are exceptionally crispy, expertly made with wholegrain rice, buckwheat and chia seeds. High in fibre, low in saturated fat and only 122 calories per serving, they make a wholesome and satisfying snack any time of the day. Lightly seasoned with sea salt to complement the nutty flavour of buckwheat, these non-fried chips are a delicious alternative to potato crisps. Enjoy straight from the pack or with your favourite dips. Wholegrain / Non-fried / Gluten Free / High in Fibre / Sugars Free / No Artificial Additives This product is Gluten-free, is Organic and is Vegan.